The South African big wave community have been charging both at home and around the planet for many years. Surfers like Grant Twig Baker, who just won the Nazare Challenge, focused the eyes of the world on the spots in and around Cape Town. Sunset Reef and Dungeons are the focal point of that attention. Satori, the new film by Rick Wall, tells the stories of the surfers who have pioneered these spots and that of the new generation of chargers. The big waves of the Cape have a fearsome reputation for good reason. Giant, powerful swells out of the Antarctic Ocean slam into the Cape Peninsula, the water is frigidly cold and the world’s biggest oceanic predator, the Great White, petrols the waters. The surfers who push themselves in these waters are a special breed. Satori will take you into their lives and their passion for big waves. 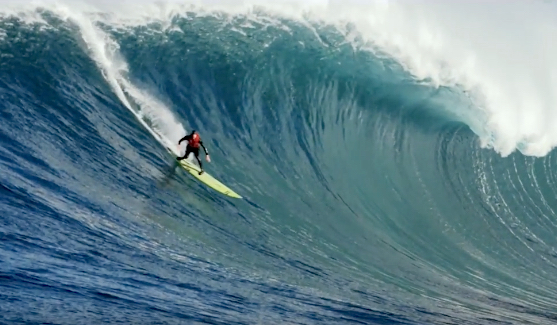 The movie does not just cover surfers who are famous world wide, like two time Big Wave World Champion, Grant Twig Baker, and adventure legend, Chris Bertish. It will also show you into the somewhat mystical pioneers, like Pierre De Villiers and Mickey Duffus. The new school of guys like Matt Bromley and Jeremy Johnson are also covered. This film will take you into the tight knit community and show you their lives.